So I was just sitting here, at my kitchen counter, where I always sit when I'm online, and I heard a little dog snore behind me. I turned around and saw this. Gert, the black dog almost never sits in that chair and the fact that she's there now means she must think I'm about to eat breakfast or something, and she wants to make sure Simon doesn't get any tasty morsels while she's out in the other room. Usually she sleeps on the couch in the living room. 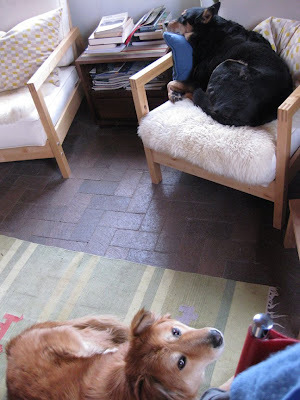 Simon, the orange dog, is always on the rug behind my chair. Gert will never sit in the other chair, because I never sit in the other chair. Pets. So awesome.